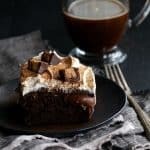 This Peanut Butter Mocha Poke Cake is so decadent, so rich, and so incredibly easy! 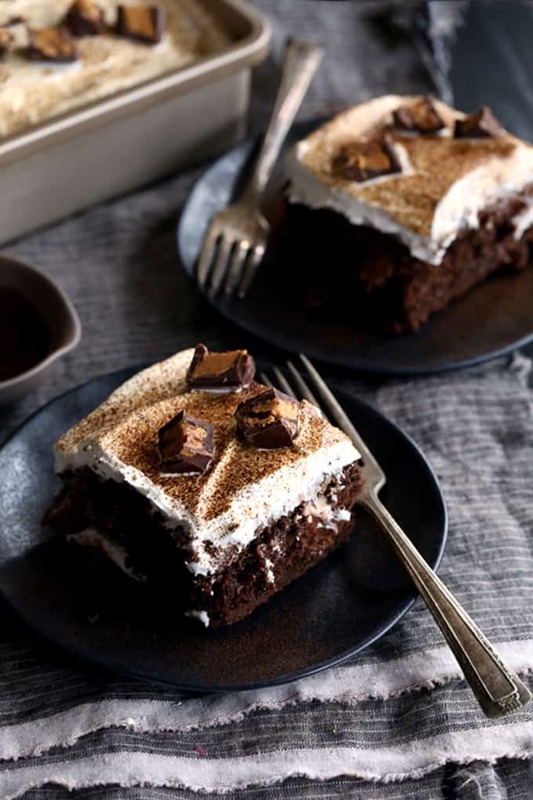 A mocha chocolate cake is flooded with peanut butter chocolate pudding before being topped with layers of mocha ganache, whipped topping and dark chocolate peanut butter cups before being dusted with espresso powder. I’ve mentioned before that March is birthday season in our house. Three of our four children have birthdays within 10 days of one another, my sister-in-law is the day after the last child’s birthday and my husband’s is the first day of April. So when my mother-in-law offered to make a cake on her last visit to celebrate everyone’s special day, I politely asked if we could have something other than cake. I was on cake overload! But then what did I do? 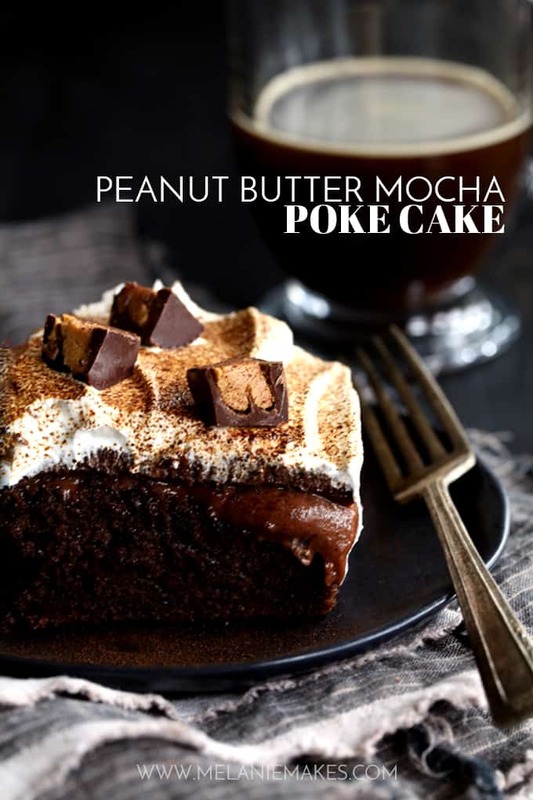 The idea for this Peanut Butter Mocha Poke Cake popped into my head and I made yet another cake! Luckily, my mother-in-law just laughed at my antics. She also happened to enjoy a slice of it as I had just made it the day before she arrived in town. Thumbs up all around! A mocha chocolate cake is flooded with peanut butter chocolate pudding before being topped with layers of mocha ganache, whipped topping and dark chocolate peanut butter cups. 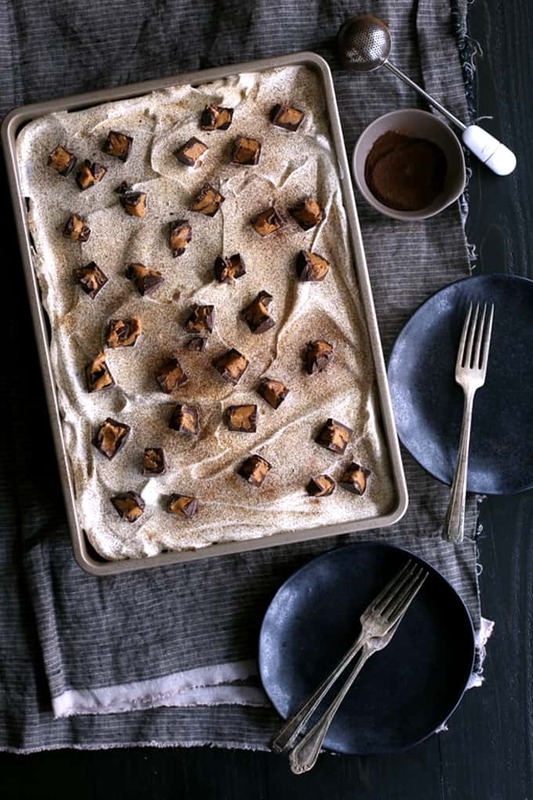 As a finishing touch, this Peanut Butter Mocha Poke cake is then dusted with espresso powder. So decadent. So rich. So incredibly easy! My love for all things mocha is very strong. Some other delicious mocha desserts that have come from my kitchen are my dreamy Homemade Oreos with Mocha Cream Filling, my no bake Mocha Coconut Frappuccino Pie and my holiday season favorites, Mocha Peppermint Crunch Cookies. For this cake, I broke into my stash of Justin’s Mini Dark Chocolate Peanut Butter Cups. You know, the ones I hide in an upper cabinet for fear that I might actually have to share them with someone? I love that they’re not overly sweet and they’re made from natural ingredients. The perfect addition to this cake! 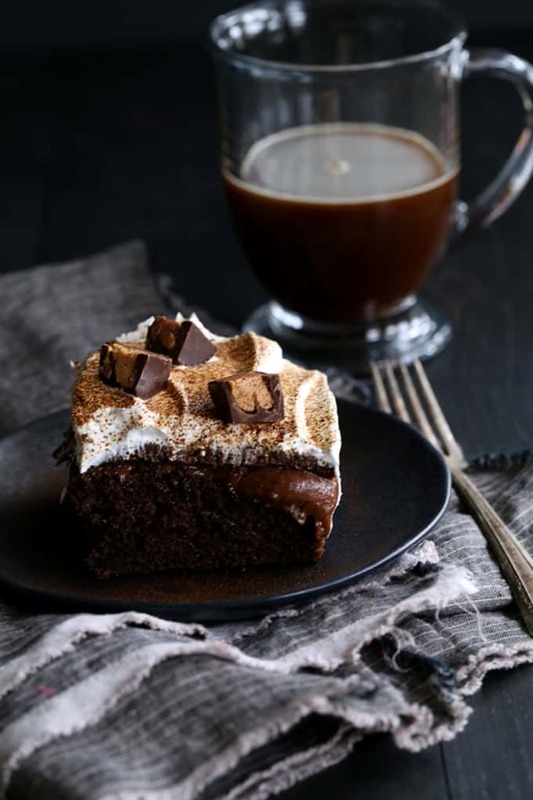 I love the magical quality that a dusting of espresso powder gives the top of this Peanut Butter Mocha Poke Cake. I’d say it’s an optional step, but really, how can you skip it when it makes your cake look so pretty? For those of you non-coffee lovers, myself included, have no fear! The espresso powder simply deepens the flavor of the chocolate making it less sweet and more rich. I might need an intervention from my espresso powder sprinkling wand over here. Mocha everything, I say! Mix cake batter according to box directions and stir in 2 tablespoons instant espresso powder. Pour batter into 9x13 pan and bake cake according to box directions. Remove cake from oven and set aside. Poke holes all over top of cake with the end of a wooden spoon. Immediately whisk together milk and peanut butter until spoon. Add instant pudding and whisk until just combined. The mixture will thicken quickly, so act fast! Pour pudding mixture over cake, allowing it to fill all of the holes and refrigerate for four hours. In a microwave safe dish, microwave 2 cups dark chocolate chips, heavy cream and tablespoon of instant espresso powder for one minute. Whisk together to combine and spread evenly over cake. Refrigerate until set. Spread whipped topping evenly over cake and top with peanut butter cups. Garnish with additional instant espresso powder. Everyone loves poke cakes because they’re so incredibly easy – myself included! My friends have also come up with these creative variations that are perfect the next time your sweet tooth strikes. This Lemon Burst Poke Cake is perfect for warmer months and this Boston Cream Pie Poke Cake is the perfect combination of two desserts. And of course, this decadent Turtle Poke Cake looks absolutely amazing! These looks really heavenly! I need to give it a try! Mouthwatering! This is a must make poke cake! Yummmmmmy! I would LOVE a slice of this cake right now! It looks crazy good! This is an epic poke cake! What a fantastic flavor combination!! This is a poke cake I could totally get into! One of my favorites, Paula! Holy guacamole! This looks insanely delicious and rich! I'm loving it to satisfy my sweet tooth! Can this cake be made a day ahead of serving? Hi, Elles - Leftovers are great the next day so I think you'd be fine! These photos are so gorgeous Melanie! I LOVE them! The espresso does indeed look magical. We have three birthdays in March too so I know the feeling of being caked out! Thanks so much, Courtney! I seriously ate slices of six different cakes in the span of three weeks. Crazy! I like the way you think, Shinee! That is one gorgeous cake! I wish I had a nice big slice right now with my morning coffee. Yum! What a perfect way to start your day, Cyndi! I can't take my eyes off this cake! AHH-MAZING!! You're so kind, Andi - thank you! This is seriously stunning. I could eat the entire thing...in one sitting. I like the way you think, Jessica - grab a fork! Melanie, this is the ultimate poke cake! I've got to make this very soon. This is AMAZING! 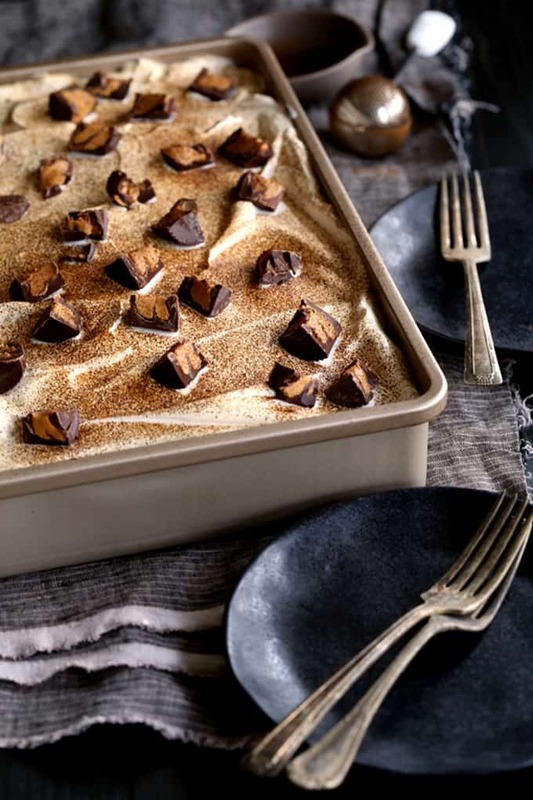 You packed all of my favorites into one dessert, I cannot wait to make this! Thank you so much, Christine! Let me know what you think if you make it! This cake is GORGEOUS! I'd love a slice right now! Pure bliss! You're so incredibly kind - thank you, Anna! You better believe it - oh what a meal we could make together!